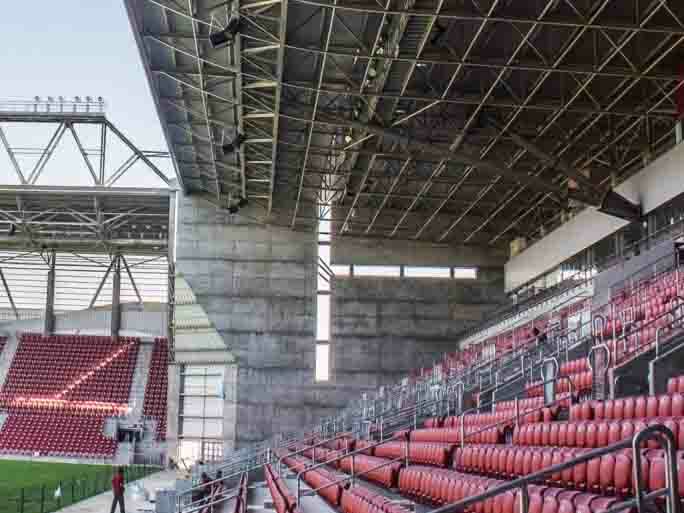 Designed by one of Israel’s most well-known architects, Goldschmidt, Arditty and Ben Nayim (GAB Architects), Turner Stadium was a long time in the making. 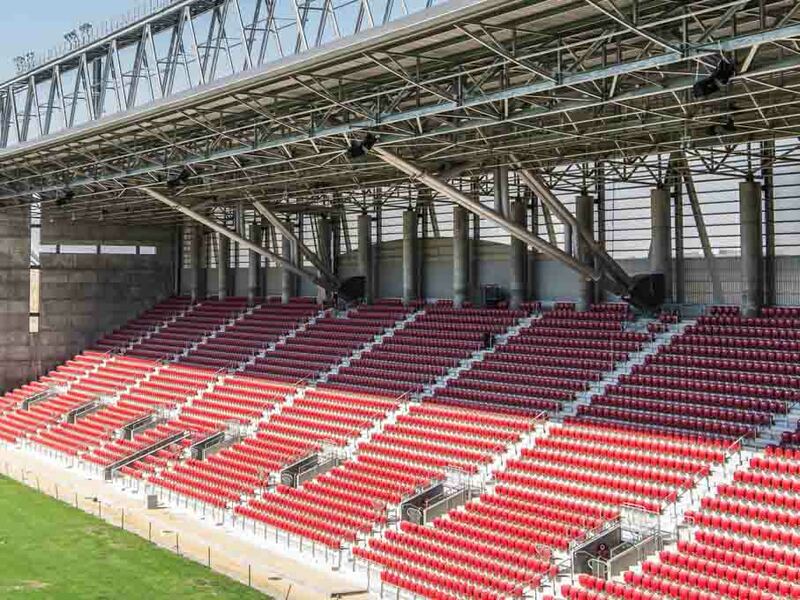 However, with it being only the second stadium in the country to have stands on all sides and a roof covering all fans, the venue has quickly made its mark. 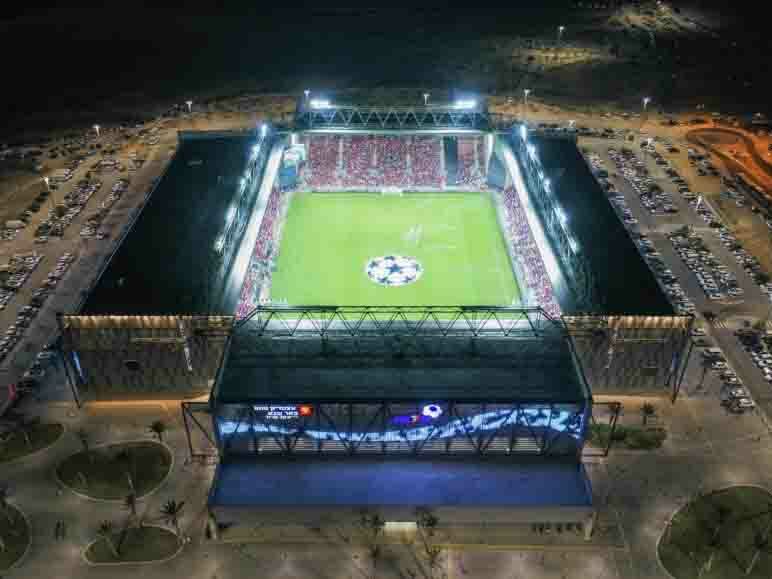 At a cost of $63m, the new site is in the northern outskirts of Be’er Sheva – which is quite a distance from the old central Vasermil Stadium – but it means a larger capacity of just over 16,000 and more facilities to offer fans. Local distributor and installer, Protouch was brought onboard early in the process, having been selected for its knowledge and experience in complex projects, as well as its reputation for taking on difficult tasks and making them a success. The Turner Stadium installation required a new audio system, LED screen inside the venue, as well as an LED façade for the exterior, and the Protouch team has expertise in all areas. Lighting Designer for the project, Netanel Klein discussed his vision with Protouch’s Director of Development and Planning Department, Shalomi Ben-Abet and together they accomplished a precise plan for the stadium. Looking at the exterior to begin with, a decorative red wave across the façade was the design of choice. The aim was to emphasise the unique structure of the building, and make the wave a jewel that sparkled at night. In order to ensure the red wave was the only lighting detail that could be seen as night though, it had to be created using a flexible LED screen. The main challenge was concealing the electrical infrastructure on the façade, which was achieved using a customised cover that was fixed to the LED pixels. When it came to content for the LED screen, this posed another challenge. There were three distinct functions for the screen: from sunset until 2am when the displays needed to produce soft content with faded transitions; during the football games when the content was required to be bolder and brighter; and finally for special events, with content varying dependent on the occasion. MADRIX software was chosen for the pixel control. It has allowed Protouch to create a spectacular and colourful canvas, which stands in stark contrast to the plain surrounding landscape. The structure and its outer wave-like design are definitely a fascinating sight in the heart of the desert. Protouch also specified the audio system for Turner Stadium, selected a TW AUDiO PA. The 32 TW AUDiO T24N 90º version have been equally distributed on 16 points throughout the stadium. In order to shorten the cable routes one amplifier rack has been installed above each of the four tribunes. The T24Ns are being powered by Lab.gruppen amplifiers of the PLM+ Series. The PLMs offer numerous redundant signal inputs for operational safety and to avoid any failure during operation. An optical double fibre ring distributes the signals through the Dante network to the four amplifier racks.